Hello,Machinemade Brothers,I'm not dead I just smell that way.Sorry for not stopping in as often but I have been extremely busy taking care of 4 cemeteries and doing tombstone repair work at another cemetery. Fall is approaching so things should slow down soon.I stopped in at our local Legion the other evening to pick up some funds towards veteran headstone cleaning and a gentleman sitting beside me pulls out a pack of Dutch Masters Presidents,I told him goodctaste in cigars and he then offered me one which I accepted. Now smoking a King Ed,take care all I'll stop in as time permits. I always think to myself as I read these threads that they could use a little more Duke. ----A-a-a-and he-e-e-ere we g-o-o-o-o-o. When you've got the time, it is always a pleasure to see you here, friend. You're right though. Your posts don't smell all that great. They've got the specialized whiff of brotherhood and camaraderie which is an an acquired taste for most. Keep it pungent, brother! A tip of my fedora your way. Keep your black powder dry. Tampa Sweet Perfecto with sweet iced tea on the side. This has become my go-to machine made cigar! 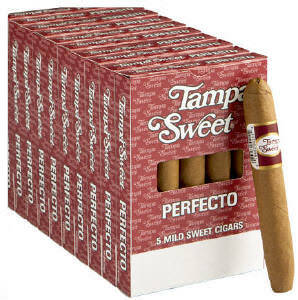 Just placed another order of 50 Tampa Sweet Perfectos from JR Cigars. Do those also have a slight vanilla taste to them? The weather has finally cooled off a little and the machine made cigars have come back out. Now that it’s cool enough to drive The Kenworth with the windows down I’m back into my stash of goodies. This morning it’s an FX Smith’s Judges Cave and on deck, a White Lightning Crook. I need to look into my storage box buried in the bottom of the armoir, I know there are some Travis Clubs in there. Maybe tomorrow. I haven't been smoking a lot of machine mades recently, except for a White Lightning Crook at day's end. These tasty cigars are the perfect way to conclude a long evening of furious typing and deep introspection.